Blend all ingredients well in a large bowl, then slowly add 1-2 cups water and blend until the consistency is like pancake batter. Pour batter into a large silicone coated baking tray (we use these: http://www.bedbathandbeyond.com/store/product/USA-Pan-Non-Stick-Jelly-Roll-Pan/1017924834?Keyword=USA+silicone+baking+sheet). Bake at 350 for 20-25 minutes until edges are golden. Allow to cool, then top with your favorite oil-free, sugar-free, low/no salt added tomato sauce and sliced/chopped vegetables of your choice. Put pizza under the broiler for around 5 min until vegetables appear to be cooked. 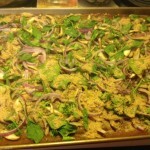 Remove from oven and top with vegan parmesan** Slice, serve and enjoy! **Vegan Parmesan: in a food processor fitted with the "S" blade, process 1 cup nutritional yeast, ½ cup walnuts, hemp seeds, or other nuts/seeds of your choice, and 2 Tbs garlic powder until well blended. Store in the refrigerator in a glass jar.